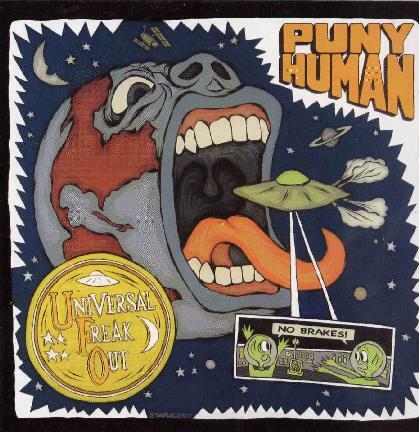 The title of Puny Human’s third album, Universal Freak Out, coupled with the cover art featuring aliens, flying saucers and a big In the Court of the Crimson King-like mouth had me ready for something a little bit more spacey and psychedelic than what I got when I listened to the album. Not to say what I heard was bad, it’s just my expectations were set up for something a little more different. Maybe I’m being overly critical here, but that’s not the intent, I’m just trying to keep in mind that this is a webzine dedicated to space rock. Don’t get me wrong, the music is good rockin’, high-energy fun, and if that’s what you’re looking for, you’ll get it here in spades. If you’re looking for something freakier, spaced out and psychedelic, you’ll have to look elsewhere. Puny Human plays straight ahead heavy rock, no muss and no fuss about it.